Look up from now through the weekend and you might just see a piece of aviation history - a 90 year old airliner still flying. TUCSON, Ariz. - We take modern air travel for granted and maybe complain about it. But we are going to take you back--way back---and up in the air -- to the days when air travel was young -- and a trip in the air was a real adventure. 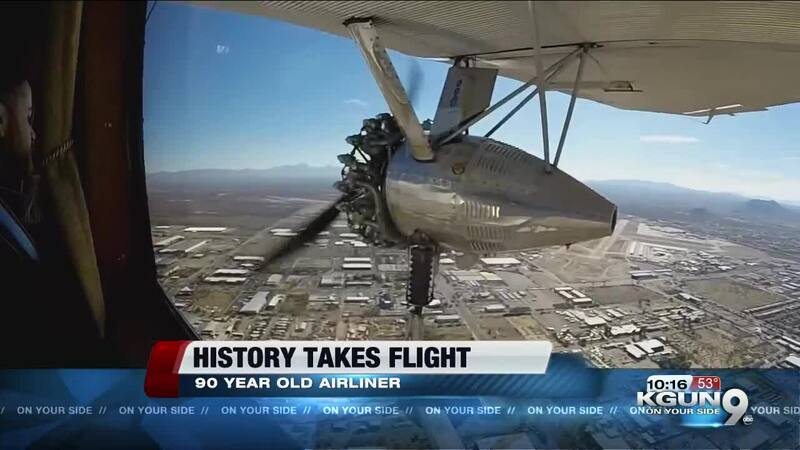 Through the weekend there’s a plane at Tucson International that flew it's first passengers 90 years ago. The Ford Trimotor made it practical to have regularly scheduled airlines in this country and we had a chance to see what being an air passenger in the 1920s was like. The Ford Motor Company built almost 200 of these Trimotors. The one at TIA has been flying since 1929. The Experimental Aircraft Association brought the Trimotor to Tucson. This plane has the sort of long and interesting history many Trimotors acquired as more modern planes replaced them on prime routes. At 90 years old, it's hardly experimental, but the EAA uses it to get people excited about aviation for fun as a profession. The EAA has a local Tucson chapter as well. Pilot Steve Lambrick says the old Ford takes a lot more muscle than the Boeing 737 he usually flies. "With three engines, it's hard to keep them all in sync. It's loud, it vibrates. It's just early, early technology, early aviation," "It's really like a time machine that lets you go back in time and see what it was like to travel by air in the twenties." But Lambrick knows this old plane helped build the industry he flies in today. He says, "You know prior to these being built there were mail planes where they would throws a few people in a few extra seats. Maybe three, four or five people would fly with the mail and it was the Fords that saw the need for the plane that was exclusively for passenger travel so they decided to build America's first airliner which is what this is." The old Trimotor is loud inside and certainly not as smooth as a jet but it's a comfortable ride and passengers in the 20's had a lot more legroom than we do in the 21st Century. Mike O'Grady got a really prime seat---where the co-pilot would normally be. "That was just awesome. Let me tell you that was such a thrill to be up there, watch these big engines, one on each side, one on the front. It's like this is a piece of history that guys our age have never had a place to ride in mostly." And this tough old plane has a lot of years left, teaching us what air travel was like before we took it for granted. The plane will be flying from 9 a.m. to 5 p.m. through Sunday at 7211 S Park Ave. That's Pima Community College Tech Center on the western edge of TIA. To take a ride in this piece of history will cost $70, but looking is free. If you'd like to see the plane or buy a ticket, please call: 920-379-8339.